← What Happens If You Miss the 10 Worst Days of the Year? Major U.S. indexes posted fresh record highs for third time this week, first time since July S&P 500 Index (+0.1%), Dow (+0.2%), Nasdaq (+0.1%) hit new highs simultaneously. NYSE volume ticked up, breadth fell, though advance/decline positive at 1.1:1. Energy led all sectors, is up nine of past 10 sessions, as WTI crude oil rallied 2.2%, while interest rate sensitive utilities and real estate lagged. Treasury selloff continued with 10-year yield up for third straight day; +3 basis points (0.03%) to 2.20%, helping lead U.S. dollar (+0.7%) to third straight advance. Commodities – WTI crude oil closed +2.2% to $49.38/bbl. after U.S. report showed bigger-than-expected drawdown in gasoline inventories, COMEX gold -0.4% to $1326/oz., industrial metals lower across the board with copper -0.7%. U.S. stocks little changed as markets focus on Washington, hurricane distortions in inflation, jobs data, and hawkish statements from Bank of England (BOE) (details below). European stocks up slightly midday. STOXX Europe 600 +0.1%, with strong auto sales data supporting automakers. FTSE 100 -0.7% after hawkish comments from BOE this morning. Pound sterling +0.9% vs. U.S. dollar. Asian markets mixed. 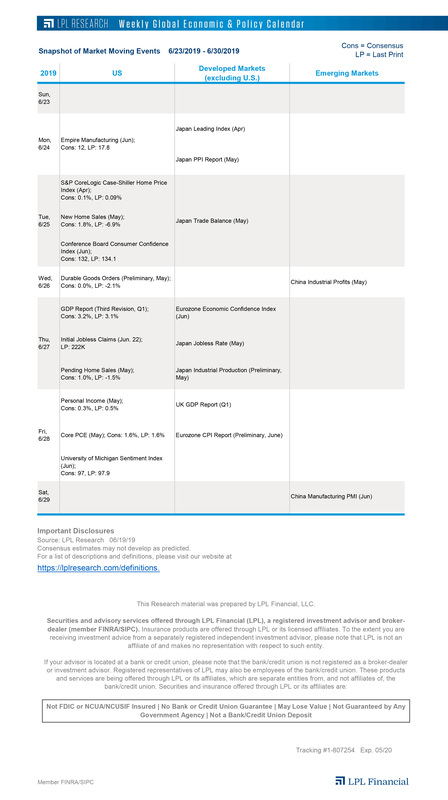 Soft industrial output, fixed asset investment, retail sales data out of China overnight weighed (details below). Shanghai Composite -0.4%, Nikkei -0.3%. Treasuries little changed – 10-year yield hovering around 2.20%. U.S. dollar little changed vs. euro, yen. Commodities mixed. Strong demand outlooks from IEA, OPEC and Libyan production disruptions lifting oil (+1.0% to $49.80/bbl.). Soft Chinese data weighed on industrial metals, particularly copper (-1.3%); gold flat near $1325/oz. Today’s economic data includes jobless claims, consumer inflation (details below), both impacted by Harvey and Irma. For the week ending September 9, 2017, post-Harvey but pre-Irma, claims +284K vs. +300K consensus vs. 298K prior week and ~+60K vs. recent trend. Markets remain focused on tax reform, where the latest news indicates Republican leadership and administration officials are planning to release a tax-reform framework during the week of September 25. After that framework is released, Congress can focus on the difficult task of passing a budget resolution, expected in October, which would enable tax reform to pass the Senate with a simple majority vote through the reconciliation process. Tax reform becomes nearly impossible without reconciliation, so we will watch developments on the budget resolution very closely. We remain skeptical that a bipartisan tax deal can be reached. However, President Donald Trump’s willingness to deal opens up other possible unexpected avenues for fiscal progress that had not previously been anticipated. Following his deal with the Democrats on the short-term debt limit extension and government funding, the President and Democratic leadership on Wednesday reportedly agreed to protections for illegal immigrants brought to the U.S. as children (known as “Dreamers”) that included border security spending, but not border wall funding; though Trump has contradicted Democrat’s interpretation and denied a deal is done. The consumer price index (CPI) for August rose 0.4% month over month (+0.3% consensus) and 1.9% year over year (+1.8% consensus), as higher gasoline prices led to a slight bump in the headline measure. Core CPI, which excludes gasoline and food, rose 0.2% month over month as expected and +1.7% year over year (+1.6% consensus). The Federal Reserve (Fed) will look past the temporary impact of the hurricanes and is unlikely to be influenced by any of these data points, but that does not change the recent trend toward lower inflation and slower job growth that puts more Fed rate hikes in 2017 somewhat in question. Chinese economic data was weaker than expected. Retail sales were up 10.1% (year-over-year), which was healthy but less than expectations and previous month’s figures; while industrial production grew at 6%, again less than expectations and previous data. Fixed asset investment, which can represent over 40% of Chinese gross domestic product (GDP), rose 7.8%, again below estimates. This suggests China’s economic growth is slowing after accelerating at the end of 2016 and into the first half of 2017. To some extent, this slowdown is intentional, as the government continues to tighten rules on lending to reduce leverage in the banking system; though leverage is still very high throughout the economy. It is unlikely that fixed investment will fall too much as China begins to implement its “One Belt, One Road” infrastructure plan to modernize Chinese ports, rail, and other transportation infrastructure. The BOE left interest rates unchanged this morning, as expected. However, comments were more hawkish than expected. The markets are now pricing in a roughly 50% probability of an interest rate increase at the BOE’s December 14th meeting, a probability that was only 20% a few days ago. Weakness in the British pound, and the potential impact on inflation, is one of the primary drivers of the potential change in monetary policy. U.K. consumer inflation is still under 3%, but prices of raw materials, including energy, have increased sharply since the Brexit vote last year and are annualizing at 7.6% according to statistics issued earlier this week. This puts pressure on the BOE to defend the pound. In fact, the pound rose 1% immediately after the announcement, though trading has been very volatile. Despite the hawkish statements, many still worry about the potential impact of Brexit on the U.K. economy and suspect that the BOE, like the Federal Reserve and ECB, are overestimating their ability and willingness to truly tighten monetary policy in the face of uncertainty. New highs again. The S&P 500, Dow, and Nasdaq all closed at fresh all-time highs yesterday. It was the 48th new high of 2017 for the Nasdaq, which has the all-time record of 61 (seen in 1999) within range. The S&P 500 made a new high for the 33rd time this year amid little volatility. In fact, the S&P 500 moved in only a 0.25% range (from high to low) yesterday, which was the smallest daily range since August. Take note, the average daily range so far in 2017 is a record low of 0.54%, well beneath the previous record of 0.70% in 1993.